[121 Pages Report] The global economy and easy access to open and free trade between countries have increased the importance or requirement of having standards and test methods for achieving consistent performance parameters. Furthermore, along with the globally applicable standards, each country may have its own specific set of applications and environments in which the product needs to perform. Having multiple standards for same performance parameters may create confusion and can also act as a trade barrier for manufacturers of the product. Hence, in order to avoid this, harmonization between these standards and test methods is necessary for which proper regulatory framework is required. In addition to this, the growing demand for the sterile medical packaging also highlights the need to implement an efficient regulatory framework in the industry. The market for sterile medical packaging is estimated to grow from USD 26.55 Billion in 2015 to reach USD 35.07 Billion by 2020, at an estimated CAGR of 5.72%. The segmentation considered for this report is based on region. The region consists of North America, Europe, Asia-Pacific, and Rest of the World (RoW). The base year considered for the study is 2014 and the market size is projected from 2015 to 2020. 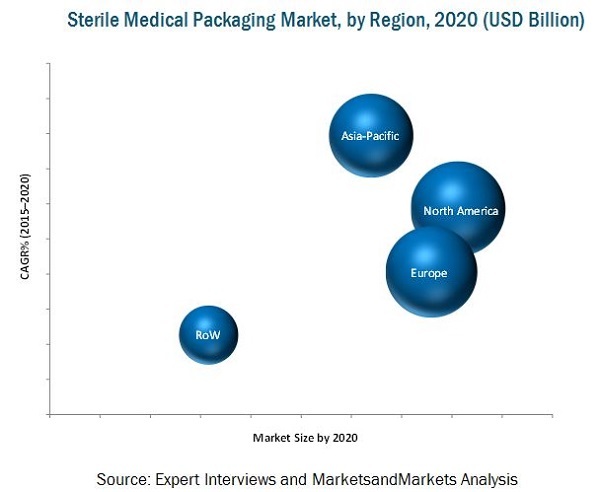 MarketsandMarkets projects that the market for sterile medical packaging will grow from USD 26.55 Billion in 2015 to USD 35.07 Billion by 2020, at an estimated CAGR of 5.72%. The sterile medical packaging market has been growing in accordance with the growth in the packaging industry. Factors such as increasing aging population, growing demand from the healthcare sector, and the popularity of using reliable packaging are driving the demand for sterile medical packaging. The growing demand in the sterile packaging market highlights the need to implement an efficient regulatory framework. The European regulatory framework is stronger, effective, and organized. Countries such as France, Germany, Italy, and the U.K. have been considered for the study. The EU has implemented standards & regulations such as Medical Device Directive, which is applicable in the European Union and eliminates the trade barrier and significantly improves the processes involved in the sterile medical packaging industry. On the basis of key regions, the market for sterile medical packaging is segmented into North America, Europe, Asia-Pacific, and Rest of the World (RoW). The Asia-Pacific region is projected to be the fastest growing region, by 2020. This is mainly due to emerging economies in China and India, coupled with rising consumer spending power and the growing middle-class population. The regulatory framework in the sterile packaging market is complex and varies from region to region. However, in order to avoid confusion among manufacturers and ease the trade barrier, continuous efforts are made to harmonize the multiple standards and regulations to form global standards. The report studies and covers sterile packaging regulations and legislations in North America, Europe, Asia-Pacific, and RoW. The regions have been further studied based on laws prevalent in the top countries. The countries studied in the report include the U.S., Canada, Mexico, Germany, France, the U.K., Italy, China, Japan, India, Australia, Brazil, Argentina, and South Africa. 6.2.2 Key Governing Bodies in the U.S.
7.6.4 Key Governing Bodies in the U.K. Figure 17 Revenue Generated By Pharmaceuticals and Medicines in the U.S.